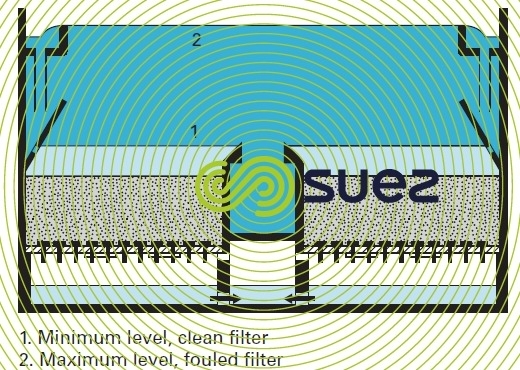 The entire throughput to be filtered is evenly distributed at the filter inlet, where water fails from a variable height depending on the level of fouling. 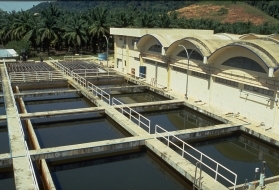 When the filter is clean, the sand is barely covered with water to a level (1) that is maintained due to the depth of the filtered water outlet weir. At maximum fouling, the level rises to the supply water level (level 2). In general, this water level rises from 1.50 to 2 m, depending on filtering mass granulometry. These filters tend to be more basic but there is a danger that the floc will break up, possibly affecting filtered water quality.